“Tories neck and neck with Labour,” reported The Sunday Times. Revisiting the questions that Uncut posed for George Osborne prior to the Autumn Statement allows us to assess how the landscape is evolving. 1.) Has the relationship between economic and Tory recovery broken? Last October Uncut ran a regression to analyse the relationship between economic sentiment and Labour’s poll lead. This indicated that for every 1% increase in the proportion of the electorate reporting the economy as doing well, the Tories would close on Labour by 0.6% – ‘the Todd thesis’, as Lewis Baston christened it. The table below, which uses figures from YouGov, shows how these variables have evolved since then. The upward trend in economic sentiment is clear. Labour’s lead over the Tories, though, remains much the same now (5.6%) as last October (5.7%). This is the stuff of the ‘voteless recovery‘ that Tories fear. Digging deeper into these numbers, however, raises some challenges for Labour. The table shows that Labour’s lead was largest during November and December. This might be explained by the popularity of Labour’s price freeze commitment made at party conference. As this commitment has featured less prominently in political debate, Labour’s lead has withered. The freeze says: “There is a recovery for some but many of us are feeling the squeeze.” With Ed Miliband beginning Budget week writing in the Guardian about inequality, Labour’s pitch is now explicitly grounded in egalitarianism. The logic of “no more boom and bust” was as redundant at the bottom of the cycle as at the top. While crediting Osborne with the upswing can be challenged as robustly as blaming Gordon Brown for the downswing, the direction of travel is clear. 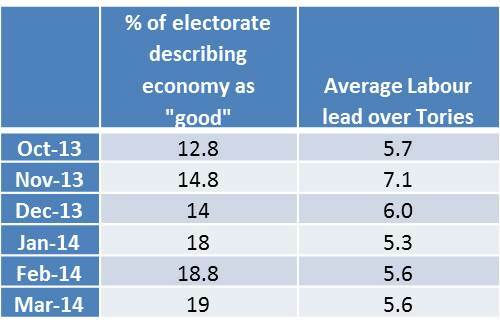 In March 2013, an average of less than 4% of the electorate thought the economy was doing well, while the Labour poll lead averaged over 10%. Economic sentiment has since improved and Labour’s poll position deteriorated, suggesting that the drivers within ‘the Todd thesis’ may assert themselves over a longer time horizon. 2.) What’s ‘the global race’ all about? We now seem to hear more from Miliband on the Tories – and, indeed, the SNP – threatening ‘a race to the bottom’ than Osborne urging us on in ‘the global race’. He didn’t give us a Budget ‘to win the global race’ but for the ‘maker, the doer and the saver’. Osborne recently conceded that Britain doesn’t export and invest enough. If we save more, as incentivised by his ISA reforms, we’d have more resources to invest. Via this policy mechanism the Budget links to ‘the global race’. But it has been rhetorically marginalised. The truth may be that those voters who the Tories most urgently want to recover, the discontents attracted to UKIP, feel their races are run. And now want their pensions to go further. 3.) Should Osborne fight on the macro or the micro? During the last quarter 2013, when the price freeze contributed toward Labour’s strongest period of polling in the table, it was commonplace to argue that the Tories wanted to move the debate on from a micro debate about energy to a macro debate about the economy as a whole, as recovery ever more defined the macro picture. This recovery has continued, encouraging the improving trend in economic optimism in the table. Yet in pensions reform the Budget contained an audacious micro incursion – with similarities to the price freeze. The fiscal constraints of this parliament have made “where will the money come from?” its overarching question. In either the profits or the green infrastructure investments of private investors, the prize freeze found an original answer. Equally, Osborne’s pensions liberalisation puts money in back pockets that doesn’t come via the state. The liberalisation lets pensioners have their own money. Which seems inarguable. Even if Will Hutton and John McTernan have concerns. If these come to be substantive, Osborne’s manoeuvre will blow up in his face. Yet polling indicates it currently enjoys strong popularity. This means, for now at least, Osborne has a micro intervention with political traction, as well as a recovery that seems to turn the macro picture in his favour. 4.) How to bring it all together? When ‘the Todd thesis’ was expounded, I identified Help to Buy and botched Royal Mail privatisation as policies that could be criticised but which might help enough people feel positive about their economic circumstances to sustain a Tory recovery. Pensions can be added to that list. This adds a micro initiative (pensions) to a macro narrative (“it’s morning in Britain“) in the toolkit to be deployed by Osborne with the aim of supporting the drivers within ‘the Todd thesis’ that make a Tory poll lead more likely. Rebutting this feel-good pitch with class-based jibes would leave Labour hoping that Britain is feeling more socialist when Osborne appears to be making capitalism work. At least for those voters that he most cares about. This entry was posted on Monday, March 24th, 2014 at 3:52 pm	and is filed under Uncut. You can follow any responses to this entry through the RSS 2.0 feed.You can skip to the end and leave a response. Pinging is currently not allowed. So the average Labour lead is 5.6% is it ? UKPR puts it at 3%, a fall of 2% over the last month. Are you sure you are up to date ? Great piece EXCEPT that the Royal Mail privatisation was NOT botched. The share price was independently set and the whole issue was got away even under threat of a damaging strike. It was in truth a triumph and the subsequent price rise is mostly sitting in people’s pension pots so it’s win/win. Better that Labour embrace it (a Mandelson aspiration after all) as they have been forced to do with the pensions reforms. Well, according to the You Gov tracker I am. What you say is more in line with what ‘the Todd thesis’ predicts. In any case, I feel the key point is that Labour need arguments that are powerful in the context of economic recovery and rising economic optimism. Well, in part it does thanks to tax reliefs when the savings pot is built up. Who’d want to be “the next Labour leader”? Osborne has laid the most obvious trap for Labour on tax credits. Will the party blunder in?